We are giving away 25 prizes worth $3500.00 in our 25 Days of Christmas Giveaway! 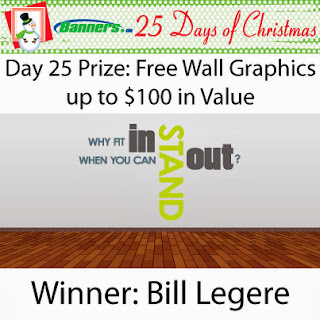 Congratulations to Bill Legere! Bill won a free wall graphic up to $100 in value. The 25 Days of Christmas Giveaway is now complete! Thank you to everyone who participated in the giveaway! For a complete list of prizes and winners visit the 25 Days of Christmas Giveaway page. Photos from the 2013 "Ugly Sweater Week"
Banners.com. Picture Window theme. Theme images by cmisje. Powered by Blogger.